We've been busy planning our garden and started a few seeds indoors this week. We hope once we finally get everything in the garden that the pests stay away. Last year we did have a few bunnies in our yard but they didn't get to our garden. Instead a nasty hailstorm shredded most of our plants. The kids received the book The Tale of Peter Rabbit by Beatrix Potter for Easter and it is one of their favorites. I'm not going to summarize it since I'm sure everyone already knows the basic plot of this classic and popular story. 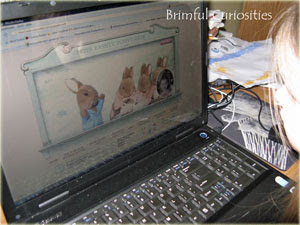 Right around Easter we discovered an amazing Peter Rabbit website. 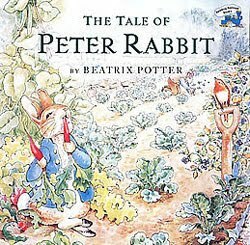 Kids can read all about Beatrix Potter, see her sketches, and learn the inspiration behind the story of Peter Rabbit. There's even online games and several printable coloring sheets. The Peter Rabbit Puppet Show is a place my kids like to visit online and we are sharing this online activity as our stART project this week. Kids star in a personalized adventure with Peter Rabbit by downloading a picture and answering a few questions. Both my kids enjoyed seeing their picture alongside Peter and listening to the accompanying adventure story. Such fun! I highly recommend this engaging website. 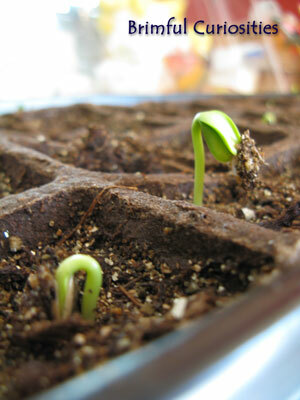 Our seeds have started to sprout! Exciting! If you want to see our art crafts this week, be sure to check out yesterday's Flowers Anyone? Wordless Wednesday post. Thanks for the website recommendations. I could use a break from PBSkids.org! That looks like a neat website! We haven't read any of the Beatrix Potter tales in quite a while--we need to revisit them. The website looks awesome. I will have to check it out. Wonderful website - I'll be sharing it with the little ones soon! And, what a terrific picture of your sprouts - excellent photography! Oh no, don't lead me into more temptation! I barely have time for my existing online activities, but it looks like your kids had a lot of fun on their virtual visit to Peter Rabbit. I can't wait to check this website out and share it with Emily. Wow, what a great site and of course a reminder of a timeless book. Love the blog. I'm a new follower. I found you on kidlit bloggers.